In her adaptation of Shakespeare’s mystical thriller, “The Tempeste,” Academy Award-nominated Julie Taymor. 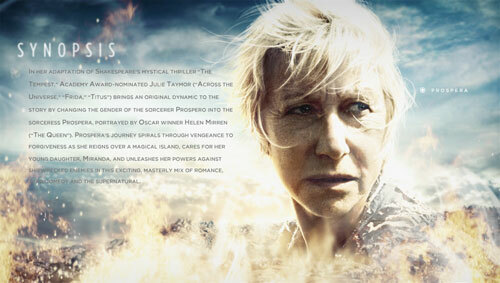 . . brings an original dynamic to the story by changing the gender of the sorcerer Prospero into the sorceress Prospera, portrayed by Oscar winner Helen Mirren. . . Prospera’s journey spirals through vengeance to forgiveness as she reigns over a magical island, cares for her young daughter, Miranda, and unleashes her powers against shipwrecked enemies in this exciting, masterly mix of romance, tragic comedy and the supernatural. In addition to Dame Mirren, the movie also stars Alfred Molina, Chris Cooper, David Strathairn and Russell Brand.